Clear cold and crisp start to the day, packed up camp. Then began the 6 kms hike back out along the rough track to the highway. At one point I tripped and fell over the top of the bike, ended up on my back arms and legs akimbo, like a turtle turned on its shell, no damage done. Just a few more scratches to add to my expanding collection- Ouch! It felt good to be back on the road again, with fair winds and favourable conditions. I quickly warmed up. 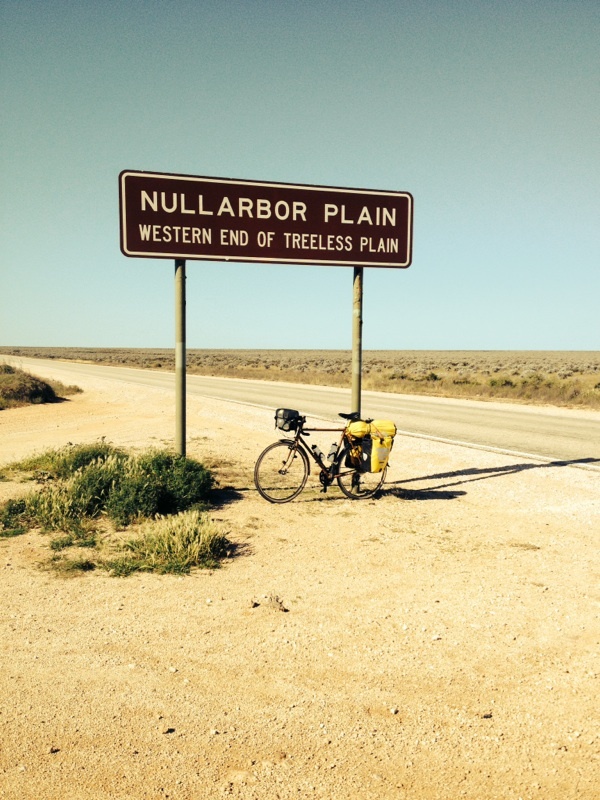 The Nullarbor can seem a brutal landscape, but riding through it you become aware of its subtleties, variations, the micro climates. Here as the desert meets the sea , the landscape appears less harsh. I take the opportunity to turn off the highway where I can to view the magnificent Bunda Cliffs, keeping an eye out for whales as I do. I’m ‘down on the drops’, pushing along at a good rate, when I hear the car approaching and slow down. A quick look in my mirror, I can see the window on the passenger side coming down. I brace myself for what I think might be coming, a bottle, abuse? I glanced across as they drew level, while the male driver fielded the questions his wife filmed me on her mobile. I guess in the absence of something more exotic. I became the point of interest. I answered all the usual questions as they kept pace with me Tour de France style, although they didn’t hand over a bag of goodies! As I reached the western edge of the Nullarbor the landscape, changes once more to become the ‘treeless Plain’ in earnest. I roll into the Nullarbor Roadhouse, a real oasis. I decide to treat myself to a room tonight. The last rest day I had was in Margaret River 3 weeks back. I’m feeling sore and tired. I will rest up before heading off tomorrow where I will be out of 21st century range- phone/ internet. Rough camping for a couple of day’s. 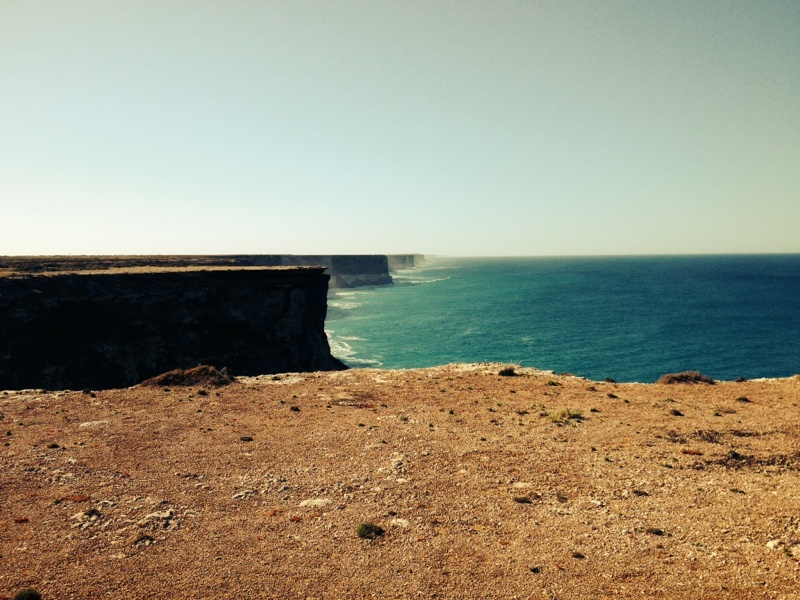 Bunda cliffs are magic. I can only imagine the beauty of camping there with the stars and sound of the ocean. Very, very glad you didn’t get hurt when you tripped. I imagine there’s not a lot of foot traffic along that path and take it from me, not fun walking 6 km back to the main highway with a sprained ankle or the like. Have spent a few nights at nullabor roadhouse transit either to or from Perth. Exorbitant prices spring to mind but a captive audience so what can you do? The thing I always love about nullabor roadhouse though is at night you can see the trucks headlights approaching for miles and then passing the roadhouse and floating off into the distance. You almost start believing the UFO stories that exist in their abundance out there. 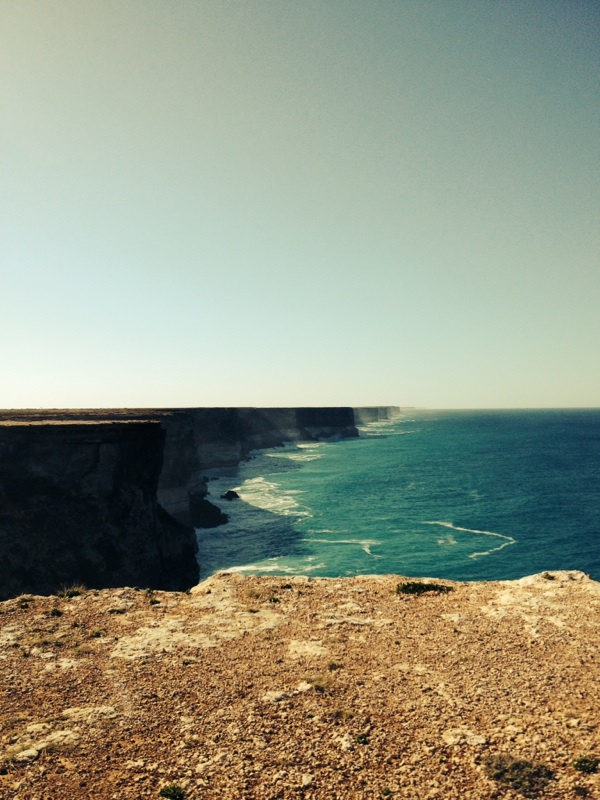 Very special energy on the nullabor. Hope you’re not feeling too sore. Georgia and I are concerned about you Nick. You need more then raison toast man! Big fry up at one of those truckers roadhouses. Tash, we have the Great Parma competition, the best Cesar salad comp etc , why not the best Raisin toast ? , The Great Australian Raisin Toast Survey of 2014 will continue , so far Anchors cafe , Middleton Beach, Albany WA is my favourite , who knows I may pitch the idea to Brumbys or the like , perhaps they would sponsor me to travel Australia sampling raisin toast , but I don’t think there would be any dough in it !! !